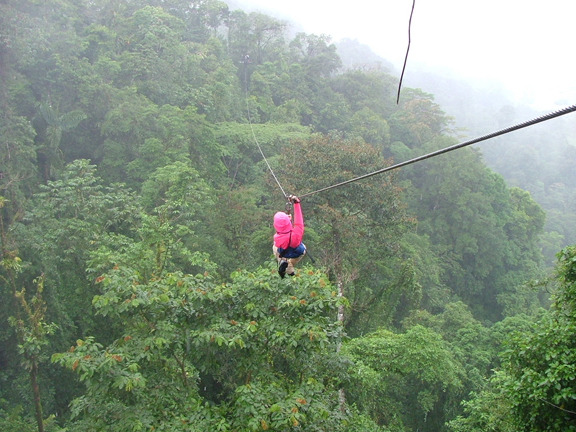 Zipline over Rainforest Canopy, Costa Rica. Photo: Ken Haufle. Creative Commons (cc). Lovins had argued that in our economic calculations, the value of inputs (and damages, or “unintended consequences”) is not fully understood or respected. I saw in the Pacific Northwest, how the preferences of timber companies to cut trees with minimal buffer strips along streams, reduced shade and habitat quality for spawning salmon, mainstay of another industry — commercial fishing. In another example, if the cost of oil exploration and production is subsidized through various means, it skews the energy markets away from the development of renewables, which arguably have greater societal benefits. Germany demonstrated this in calculating their “Feed-in-Tariff,” the amount paid for energy produced by distributed sources. Higher Feed-in-Tariffs were responsible for a boom in solar implementation on the rooftop. Rates were guaranteed over time, which made them more bankable. President Figueres defined the future value of the rainforest in terms of bio-research, “The World’s Largest Pharmacological Repository,” he said, eco-tourism, and carbon offset agreements. He felt the higher valuation is on the preservation of resources for the uses which will be defined by the needs of the future. This is important, he told me, for the future of the country itself, both economically and in defining a nation that lives with nature rather than against it. Similarly with the Mojave, with 5 – 10% of botanical resources as yet undescribed, according to Ph.D. Botanist James Andre (UCR), the potential pharmacological benefits offer a unique research laboratory and a sustainable development pathway. Therefore the maintenance of biodiversity is of the highest priority. While solar companies tout utility scale developments as “combating climate change,” the production and release of carbon from industrial scale construction by globally based industries, requiring shipping, trucking and construction is not fully quantified. Studies are beginning to indicate are that such development may be, in fact, net carbon positive over the life of the installations. Also, with the efficiencies of rooftop solar higher across the board than with solar thermal, a result of a more complex system (Solar Thermal) requiring energy transfer among different component subsystems, and over distance, it would be wise therefore to begin the line of questioning proposed by President Figueras in Costa Rica, “What is sustainable development and what does it look like in the Mojave? There is more to the picture than science and math. Those values which offer benefits for eco or adventure tourism often depend on softer calculations such as aesthetics and art. Just as President Figueres placed a priority on eco and adventure tourism, we can value the complete human experience of the desert and all that it offers.